Parents have the greatest privilege in the universe. We have the opportunity to raise kids – to construct important values to teach children and witness the result. At the end of the day, they are individuals – separate from us – who have their own minds, hearts, hands, feet, wishes, and skills. Even so, seeing my kids become the people they were meant to be is a delight. I love seeing my young daughter spin around in our living room as a ballerina. Then I see my son carefully line up his trains or the way he tends to his stuffed animals when one of them gets “hurt” and needs a bandage. From a young age, our children show us so many beautiful values they explore. However, kids enter the world with a free will, which means that “Me First” mentality kicks in pretty early. It is our job as parents to start conversations about right living – about healthy values. Understanding that money comes from labor is a fundamental lesson that will stay with your child through adulthood. You can employ him or her to do chores around the house, bring up topics to discuss, or simply lead by example in your own field of work. This world is full of cruelty, especially on the internet. Our kids are among the first generation growing where this level of connection and advancement in technology is simply a way of life. Learning to offer a kind word or do something nice at a young age will help your children counteract the ever-rampant negativity out there today. It’s so easy to take one’s family for granted. As children grow, it’s vital for parents to help them understand the value of keeping family first. There will be a thousand things that will try to take its place – especially when your children reach adulthood. As kids age, they have more and more responsibility placed on their shoulders. Therefore, they have more opportunities to do things when others aren’t hovering over their shoulders. Whether they’re male or female, what they decide in those moments matters so much more than they realize. For example, Ellen recently tested her audience members by placing hidden cameras at the free gift booth. Before the show, each member was told she could select one free item from the table. One woman was caught on camera taking multiple items and returning to the booth two more times for more! Ellen not only showed the tape to the millions of viewers of her show, but she then called out this audience member and made her sit on a stool in “Ellen Jail” right in front of everyone. What a great example for kids to see the power of owning up to their actions. To be held responsible for those choices. It’s another life lesson that would likely stay with them for life. Could we please dissolve the old adage “Practice makes perfect”? Talk about setting unrealistic expectations for kids. Now hear me out – I’m not a big fan of participation ribbons or removing competition altogether. It’s important to learn how to win AND lose with dignity and respect; however, walking up to the plate with perfection as the goal isn’t going to fly. Remind your kids to try their best, and then remind them again. And again. Just keep that flag flying! So many 18-year-olds graduate with almost no money management skills. Then, they fill out paperwork for colleges and make the largest financial decision they’ve ever made which typically lands them in debt up to their eyebrows. Being equipped with the head knowledge and habits of handling money while they’re under your roof will make their entire adult life completely different. Your kids may not grow up wanting to major in environmental studies, but educating them about how to be less wasteful should start in the home. Think about your own habits, like not littering and sorting out recyclables. 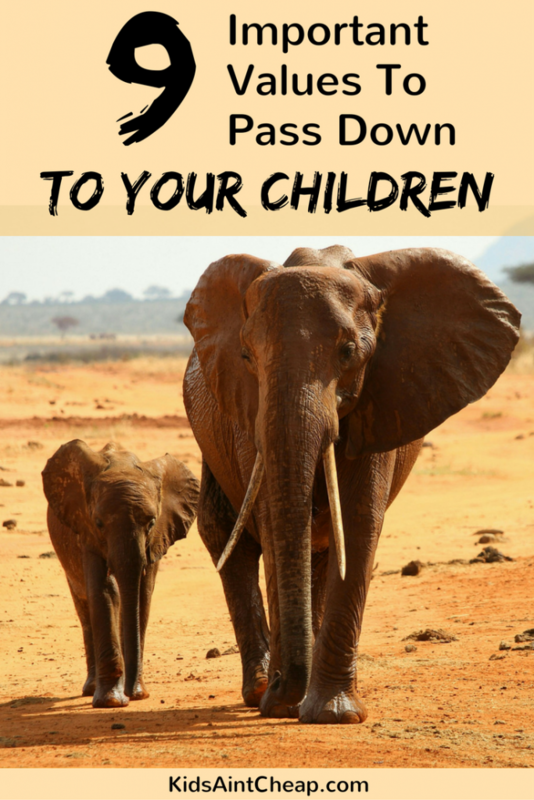 Your kids will see how you treat the world around you. Taking time to talk through those things or initiate something unique like planting a garden or using compost will help them learn skills to better protect their environment. There are so many more values we could cover. In fact, it may seem overwhelming some days. Just remember these happen one day and one conversation at a time. What’s on your list of important values to teach children? Is it on this list? Let us know in the comments below.